When storing drinking water in storage for a long time, the biggest problem is that the water may develop weird taste and odor. Then we start wondering if it still fits to drink. One absolutely effective way to tackle this problem is to use PUROGENE. PUROGENE is drinking water storage treatment approved by the EPA (U.S. Environmental Protection Agency). An ounce of PUROGENE solution is able to disinfect 10 gallon of water and when used for regular treatment, an ounce can purify as much as 30 gallon of water. Containing 2% solution of stabilized chlorine dioxide, PUROGENE – even in its concentrated form – is safe to handle. Chlorine dioxide has been known as a safe way to treat water for more than 50 years now. By using PUROGENE to treat or disinfect your water storage, there will not be any chlorine taste or odor to the water. In fact, it will eliminate other off-tastes that originally come from the water poured. 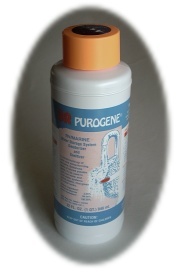 16oz PUROGENE Water Treatment is at present Bay Tec’s BEST SELLER. Functioning mainly to destroy existing bacterial colonies and to prevent them to regenerate, PUROGENE works in all types of water system. Whether it is cold water system or hot water system; plastic tanks, Fiberglas tanks or metal tanks, PUROGENE is the best choice to purify your water storage and keep it safe and drinkable for a long period of time.